Page added in March 2007. In 1291 Acre, a port in northern Palestine, fell into the hands of the Sultan of Egypt: it was the last remnant of the Christian Kingdom of Jerusalem: its loss led Pope Boniface VIII to call the first Jubilee Year, in 1300, which granted special indulgences to those sinners who visited Rome and prayed at St. Peter's tomb, thus replacing the pilgrimages to Jerusalem. Two Christian military orders showed all their valour in the defence of Acre: the Templars and the Hospitallers (Knights of St. John). The latter order had as its primary objective providing shelter and medical care to pilgrims, but it also protected them during their journey, which accounts for its military organization: the knights who joined it came mainly from southern France: they were usually cadets of noble families who looked for an opportunity to serve their faith and show their gallantry. The Order was named after the first hospice which was dedicated to St. John (most likely St. John the Baptist). After the capitulation of Acre the Hospitallers went to Cyprus which at the time was a Christian kingdom ruled by the Lusignan family. The Order was able to reorganize its structure and its ranks, but it lacked a mission; a reconquest of the Holy Land was out of the question and the King of Cyprus regarded with some suspicion the Knights' presence on the island. In 1306 Vignolo de' Vignoli, a Genoese adventurer who had a foothold on the island of Rhodes made a proposal to Grand Master Foulques de Villaret (the head of the Order) that they join forces to conquer the island. Rhodes was a possession of the Byzantine Emperor, so the Grand Master's decision was not exactly within the scope of the Order: Pope Clement V however provided him with the religious endorsement he needed by assigning Rhodes to the Order of St. John. The conquest of the island was not an easy one: titlehough the Byzantine Emperor was not able to send troops, the inhabitants of the main town (Rhodes) managed to check the Knights' assaults: only on August 15, 1308 did the defenders capitulate, but the Knights had to concede them the right to retain their Orthodox faith. The Grand Masters were elected by the senior members of the Order and their appointment was endorsed by the pope: the Great Schism had an impact also in Rhodes where the elected Grand Master was endorsed by the Avignon pope, while the Rome pope appointed a different Grand Master. The Grand Masters were all members of noble families and they put their coats of arms on the buildings and fortifications of Rhodes: their coat of arms was placed to the right of the symbol of the order (a cross). In the fortresses the Knights built on the nearby islands, the coats of arms of the Grand Master and of the Order were accompanied by the coat of arms of the fortress commander. In many cases the heraldic symbols of the Grand Masters and of the Order where displayed in a quartered shield. During the XVth century the coats of arms were surrounded by fine frames or associated with sacred images; very often the decoration was based on a plait motif, which was also used in windows and portals. 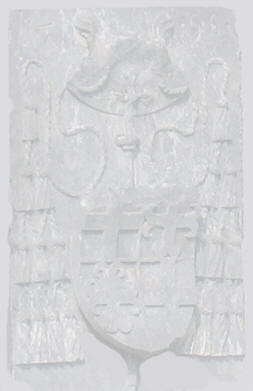 The images below show the coats of arms of most of the Grand Masters who ruled the island until 1522. 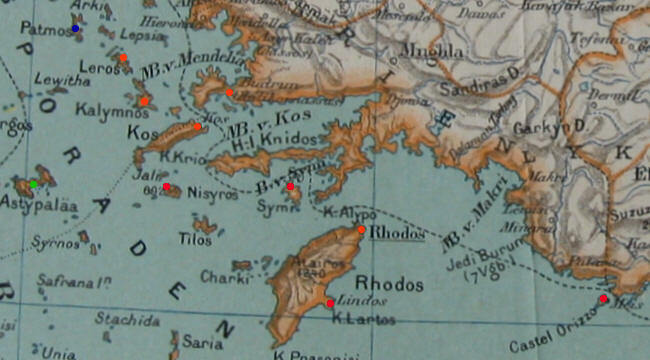 The last two coats of arms (after a red line) make reference to the Italian occupation of Rhodes (1912-43). The image used as background for this page shows a coat of arms of Grand Master (and Cardinal) d'Aubusson in the fortress of Kos. You may wish to see a section on the Castles of the Crusaders in Syria.